By a margin of 57%-35%, registered voters blame George W. Bush and the Republican Party for the poor condition of the economy, according to a new CNN/ORC poll. In his address at the Democratic National Convention President Clinton said, "In Tampa, [at the Republican National Convention] the Republican argument against the president’s re-election was actually pretty simple — pretty snappy. It went something like this: We left him a total mess. He hasn’t cleaned it up fast enough. So fire him and put us back in." The CNN/ORC poll shows that registered voters are not buying that Republican message. When George W. Bush took office, the federal government was running an annual surplus of $86 billion. The Bush tax cuts have cost nearly $1.3 trillion in federal debt over 10 years. The legacy of President Bush's eight years in office, with much of that time supported by a Republican controlled congress, should be remembered as a grand and failed experiment of what happens when conservatives are in control of the government. The failures of Bush's eight year administration cannot be chalked up to Bush alone. The $4 trillion IOU war in Iraq, the home mortgage market bubble, the collapsing economy, the Hurricane Katrina tragedy that befell New Orleans and trickle-down tax cuts (that never trickled down) were all failures of conservative ideology. Those failures are owned by every conservative in Congress who championed and happily rubber-stamped conservative legislation and the conservative philosophy of financial and banking system deregulation and tax cuts for billionaires. The truly compelling story of the Bush decade is one that conservatives do not want you to remember – the rapid and dramatic failure of conservative government. America learned what life is like under a true conservative government. With near absolute power, conservatives pursued their fiscal and social agenda without compromise. In a position of virtually unchecked power conservatives failed quickly and utterly at the most basic responsibilities of governing, leaving our nation weaker and deeply in debt, and our people less prosperous, less safe and less free. The Bush years may have been years of political and legislative victories for conservatives, but those years of political and legislative victories had disastrous and long lasting consequences for the nation. And the American people do remember all those conservative failures. The worst news in the CNN/ORC poll for Romney came when registered voters were asked which policies were more to blame for the country’s current economic problems, George W. Bush and the Republicans or Barack Obama and the Democrats. Fifty seven percent of registered voters said that Bush and the Republicans are responsible, compared to 35% who blamed Obama and the Democrats. A look at the cross tab numbers on who is responsible reveals that by a margin of 53%-37%, Independents think Bush and the GOP are responsible for the current state of the economy. Fifty six percent of men and fifty eight percent of women still hold Bush and the GOP responsible. White people narrowly hold Bush and Republicans more responsible, 48%-42% Americans under age 50 hold Bush and the Republican Party more responsible by a more than 2 to 1 margin, 62%-30%. The only groups polled that hold Obama and the Democrats responsible are Republicans (72%) and conservatives (52%). The reason why Obama is winning with everyone other than core conservative Republicans is because voters agree that the economy is improving and will continue to get even better under Obama's policies. Voters also know that last year's federal budget deficit was 12 percent lower than in 2009, according to the Office of Management and Budget, and the deficit is projected to shrink even more over the next several years. Voters aren’t believing Mitt Romney when he claims that if Obama gets reelected the economy and deficit will get worse. American voters agree with President Clinton when he said at the Democratic Nation Convention, "In 2010, as the president’s recovery program kicked in, the job losses stopped and things began to turn around. The recovery act saved or created millions of jobs and cut taxes — let me say this again — he cut taxes for 95 percent of the American people. And, in the last 29 months, our economy has produced about 4 1/2 million private sector jobs … No president — not me, not any of my predecessors, no one — could have fully repaired all the damage that he found in just four years … We could have done better, but last year the Republicans blocked the president’s job plan, costing the economy more than a million new jobs." More importantly, Republicans nominated a self proclaimed leveraged private equity buyout business wizard. And American voters believe it is those very Wall Street leveraged private equity buyout strategies that shuttered so many American businesses and moved millions of American jobs offshore to China and India. Registered voters in the CNN/ORC poll are still holding George W. Bush and his party responsible for the economy calamity, from which the nation is still recovering. This means the Romney/Ryan budget plan, which is to do what Bush did, except more so, is signaling to voters that he may very well make things worse, if elected. 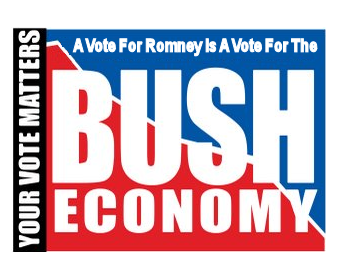 In short, Romney is failing to convince voters that the economy is Obama’s fault. The voters in this poll have not forgotten who was in office during the years that the federal deficit ballooned out of control and who was in office during the economic collapse. Mitt Romney has not been able to convince them that he would do anything to speed up the economic recovery or more quickly shrink the deficit. In fact, a majority of voters fear Romney's conservative fiscal programs might send the economy into another noise dive.